Several weeks ago, various members of the media attacked Tucker Carlson for saying, "I hate litter, which is one of the reasons I'm so against illegal immigration." Some journalists jumped to vilify Carlson, suggesting that he was referring to the illegal aliens themselves as human "litter". These journalists are perhaps unaware of the environmental problems presented by the garbage left on our southern border. Indeed, one of the most direct environmental impacts of illegal immigration is one that's clearly observable to anyone who lives at the southwest border — the thousands of pounds of trash that are discarded and left behind by aliens and their hired human smugglers. Perhaps the state hardest hit by trash at the border is Arizona, which shares 370 miles of border with Mexico. Behind only the Rio Grande Valley in Texas, Tucson, Ariz., is consistently the sector of the border with the highest number of Border Patrol apprehensions. The Arizona Department of Environmental Quality (ADEQ) estimates that over 2,000 tons of trash are discarded at the Arizona border every year. 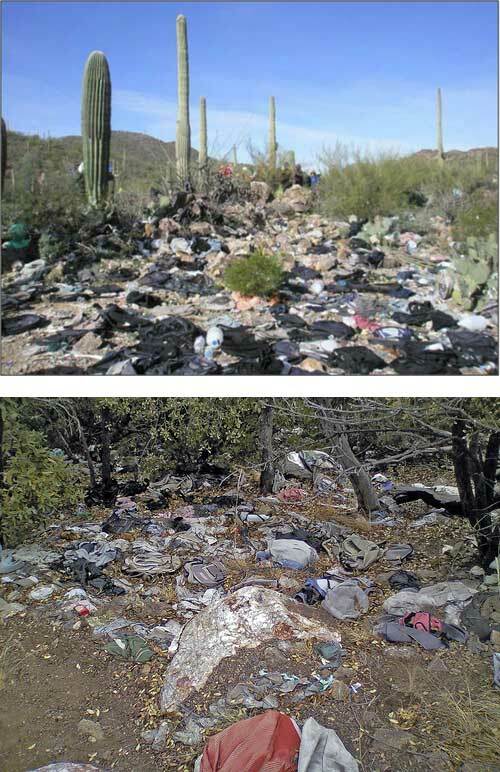 As a consequence, the department established a website entitled "Arizona Border Trash" in 2012 to coordinate and keep track of the state's trash cleanup operations. According to ADEQ, each ton of trash requires landfill fees of $37 to $49, which are footed by Arizona taxpayers. That does not include fees for materials, transportation, or labor. ADEQ further estimates that each border-crosser leaves an average of six to eight pounds of trash behind. According to the ADEQ website, border trash "has been shown to affect human health, the environment and economic wellbeing." Included among the specific impacts are watershed degradation, soil erosion, damage to infrastructure, loss of vegetation and wildlife, and escaped campfires. Using the list of collections from the same website, it is possible to analyze total amounts of trash collected by fiscal year, and compare those figures to the U.S. Border Patrol's monthly data on total illegal aliens apprehended by sector. Arizona border apprehensions include data from two sectors: Tucson and Yuma, with the large majority of apprehensions (ranging from 80 percent to 95 percent) coming from Tucson. The correlation is clear. In fiscal years 2011 and 2012, when Arizona was experiencing over 120,000 border apprehensions, over 65,000 pounds of border trash was being collected annually. In the following years, as apprehensions fell as low as 70,000, border trash collections dropped, too — reaching a low of just 19,000 pounds in fiscal year 2015 before jumping back up in 2016. Collecting trash along the border. The final Southern Arizona Project annual report — from 2016 — is still available online. While the broader program has ended, trash collections have continued into 2018. Through June of this year, over 15,000 pounds of trash have been removed. Further, BLM continues to conduct other operations that were part of the project, such as desert soil restoration. Every illegal alien prevented from crossing our southern border represents about seven pounds of garbage that will no longer be left behind to potentially damage water systems, wildlife, and soil. As such, lawmakers ought to consider that securing the border is not just a matter of national security, but environmental security too.